Whether being a full time, work at home mom was your career goal--or if it was simply a working arrangement that presented itself unexpectedly; you may officially identify yourself as a work at home mom or a mompreneur or a female entrepreneur. No matter the title; if you are working from home while raising a family--the challenges you face are bit different than a traditional working woman. Sometimes, finding balance and success as a WAHM is a little tricky--but, not really impossible! 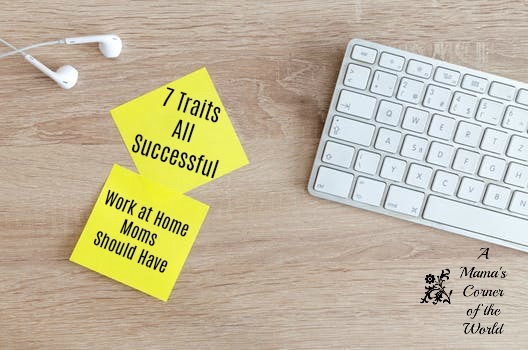 Having been both a working mom and a work at home mom ; I wanted to share some thoughts 7 Traits All Successful Work at Home Moms Should Have. Self Motivation. I think it goes really without saying that successful work at home moms must be self motivated and driven toward (and by) goals and accomplishments. When you work from home, you have a lot of freedoms. You are free to set (and follow) your own schedule. You are free to choose tasks and activities as you decide. However; with those freedoms come responsibility and accountability. You may have deadlines and projects to complete just as you did when you worked in a traditional job--but, you are not going to have a supervisor or mentor directing and following up on those activities. You need to be self motivated to stick to a schedule, plan your day's activities--and complete all of those activities necessary to reach your monetary and career goals. Strong Organizational Skills. If you are running a business from your home--you will need to be playing your A game in many areas of your life simultaneously. This requires organization and planning. Strong organization and careful planning. From scheduling the work day to accomplishing home-related tasks and child care duties--work at home moms must have strong organizational skills to keep the many life areas being juggled running smoothly and efficiently. If you aren't already strongly organized, check out this Grace Lever review to see if some of her entrepreneur training may be beneficial for you to get you off on the right foot. Flexibility. While getting organized and sticking to a schedule are so very important to running a home based business with kids or working from home as a mom--being flexible is also important. Honestly, life happens. Whether you work in an office across town or in an office over the garage--you may have days when things just do not go as planned. Sick kids, scheduling glitches, overflowing toilets, a car needing repairs, or a faulty internet connection can put the best laid, most organized day out of commission. A successful, work at home mom must be able to step back, reassess the day--and be flexible enough to find suitable work-arounds for life's ups and downs. Creativity. There are days when a successful, work at home mom is only successful because she summoned up some creativity. Whether getting creative with a 10 minute dinner in the kitchen or finding activities for the kids while you take a conference call or package a shipping order--being able to quickly and creatively think of a last minute solution to a sudden problem is key to your success. Your creativity does not need to be Pinterest-pretty either! It just needs to work for you and your family! Great Multi-Tasking Abilities. I have had days when I've been running from project to project around the house throughout an entire day. Sometimes, I make dinner while dictating a blog post or an article. Sometimes, I am helping with math homework while creating a gift basket for a client. Sometimes, I am on the phone with computer technical support while updating our family calendar and scheduling back to school physicals for the kids. I try to maintain a daily work schedule. Generally, I work from 4 to 6 a.m, then 9a.m. to 1 or 2 p.m. then again from 7-9 p.m. While my hours are fairly consistent, my work spaces range from the car to the garage to the home office to the dining room table because sometimes I just have to multitask to be both an entrepreneur and a mom with any sort of success rate! Patience. This trait should probably be first on this list! If you are going to be a successful work at home mom; you need to be patient with your family, with your clients, and--most importantly--with yourself. Sometimes it may seem that nothing is happening quickly enough or that nothing is happening the way that it should. When you work from home, you are combining, presumably, the best of both worlds. With the best, comes all of the responsibilities and accountability of each world as well. Be patient with everyone involved. Some days, be more patient than others. It will be good for your health, good for your relationships and good for your business in the long run! Positive Thinking. Really. Maintaining a positive attitude is one of the best things that you can do for yourself, your business and your family. Some days it may be difficult to focus on the positive aspects of your day when you are tired or overscheduled or feeling down. That's when it is the most important to focus on your positives! Join a community like the one offered by Grace Lever to find other like minded, work at home, entrepreneurs who share your lifestyle and goals. It is important to remember the good reasons for why you do what you do every day!